First wash the tomatoes and peppers. Then cut a thin round slice off the top of the tomatoes with a sharp knife and keep them aside. Scoop most of the tomato pulp out, with a teaspoon, and shred it finely. Cut the tops off the peppers and keep them aside. Then prepare the stuffing with the following way: Heat the oil in a cooking pan and saute the onions in it, until they look brown. Add the minced meat and let it saute for 10 minutes, stirring with a spoon all the time. Add the tomato pulp, the parsley, salt, pepper, the mint and some water and let them simmer for approximately one hour. Then wash and strain the rice. Add the rice to the stuffing mixture continue cooking for another 10 minutes. Fill the tomatoes and peppers, which you have arranged in a Pyrex dish or baking pan, with the prepared stuffing. Replace the previously saved tops of the tomatoes and peppers. 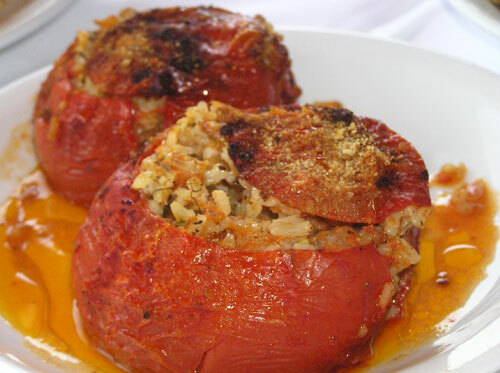 Pour some tomato juice into the pan/dish and fill the gaps between the stuffed tomatoes and peppers with slices of potato. Bake it in a medium oven for approximately 40-45 minutes.